The P/A Stock Oiler increases your die life and eliminates the "coffee-can" mess to make your operation safer and more efficient. Oil flow to both rollers is individually controlled by metering valves which are installed on the reservoir tank. Adjustable tension springs help to apply the right oil film by supplying enough pressure to squeeze off any excess which is then recycled to the unit. Pivots to accommodate material movement and crown, camber, or unstraightened stock. Mounting between the press feed and tool is easily done by attaching a magnet to the steel base, or by drilling two holes. Two wing nuts allow for quick pass line height adjustment to suit different tools. The Stock Oiler has been developed to accommodate any type or thickness of material. 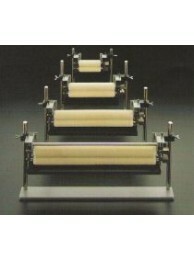 Its revolutionary roll assembly pivots to accommodate material movement and crown, camber or unstraightened stock. Any kind of lubricant is evenly distributed to the absorbent felt roller by a predrilled PVC inner tube that rides in an oil bath. Oil flow to each roller is individually controlled by metering valves which are installed on a reservoir tank that is equipped with an oil level gauge. Adjustable tension springs help to apply the right oil film by supplying enough pressure to squeeze off any excess which is then recycled to the unit. Mounting the compact Stock Oiler between the press feed and tool is easily done by attaching a magnet to the steel base, or drilling two holes. Two wing nuts allow for quick pass line height adjustment to suit different tools. The Stock Oiler is available in 5 stock with sizes from 4 to 24 inches and will accommodate thicknesses to 0.187 inches. SO-100 STOCK OILER. The P/A Stock Oiler increases your die life and eliminates the "coffee-can" mess..
SO-200 STOCK OILER The P/A Stock Oiler increases your die life and eliminates the "coffee-can" me..
SO-300 STOCK OILER The P/A Stock Oiler increases your die life and eliminates the "coffee-can" me..
SO-400 STOCK OILER The P/A Stock Oiler increases your die life and eliminates the "coffee-can" me..
SO-600 STOCK OILER The P/A Stock Oiler increases your die life and eliminates the "coffee-can" me..